What is an advisory committee and what can my program gain from having one? Each advisory committee is made up of individuals with experience and expertise in the occupational field(s) that the program serves who advise educators on the design, development, implementation, evaluation, maintenance, and revision of Career and Technical Education (CTE) programs within a career pathway. (For more information on Career Clusters and career pathways in Colorado, link to the Colorado Community College System (CCCS) Career and Technical Education website: Career Clusters). An advisory committee is required for every approved career and technical education (CTE) program in Colorado as it is considered to be an invaluable part of the program, and ultimately, the student’s success in a given career path. Why do I need to consider the committee structure? Since the onset of Perkins IV, a trend of joint secondary and postsecondary advisory committees has taken place across the country. Career pathways require secondary and postsecondary educators to work together to develop plans of study with business and industry. In a career pathways system, the curriculum is to be developed together and placed over two or more institutions. Thus, a joint advisory committee that brings together secondary educators, postsecondary educators, and industry would be advantageous. Likewise, as secondary district expand CTE opportunities, it may be advantageous to combine middle school and secondary advisory committees. Recognizing that Colorado has many geographic obstacles that make collaboration between Secondary and Postsecondary Institutions challenging, an alternative structure when having separate advisory committees is to have representatives on each committee. It is strongly encouraged for secondary programs to include information and data from postsecondary programs. This could be a Postsecondary Plan of Study or feedback from postsecondary instructors on the success of students they have from the secondary program. Likewise, middle school programs should seek similar partnerships with the secondary programs available in their district. Typically, occupational education programs within a pathway must be coordinated with other federal or state initiatives to avoid unnecessary duplication of programs and services. Advisory committees must be made aware of initiatives or legislation that will affect the program, and there may be a need to coordinate or make connections with other activities. While this may seem overwhelming to a person new to starting an advisory committee or to the committee members themselves, it helps to visualize the ways that programs are connected on the education spectrum as well as to other resources and entities within the economic system of the community and the State of Colorado. Commonly refers to a group of postsecondary faculty teaching within the same prefix or group of prefixes that discuss new courses and updates to existing courses led by an elected Discipline chair. Commonly refers to a committee of secondary and postsecondary instructors led by an elected chair and the CCCS program director for that content area focused on aligning secondary and postsecondary curriculum and considering statewide possibilities for articulation. Local economic development identify current and future solutions to workforce development issues and to find ways to target local, state, and federal resources. Entities frequently conduct labor-force surveys, which can be invaluable to advisory committees. Pathway may need two levels of workers — AAS and BS. Pathway may need to be articulated or have a capstone program. Where do I find members for my committee? It is important to note, that institutions may have a specific protocol for contacting community members to serve in an advisory capacity. Please check with your administration prior to contacting outside parties. I am ready to start contacting possible committee members; what works best? How do I attract potential advisory committee members? A quick brochure on your program is really helpful in highlighting your program’s value in the community. Many programs also have a simple advising sheet that shows the sequence of the courses in the programs. These kinds of materials are not only valuable for students and parents, but also provide the opportunity to showcase the program. Items you may include in a program brochure are: length of the program, number of students to enroll and/or complete the program, sequence of program, any limitations to programs entry (selection process? ), average GPA for students in program, student scholarships available, student internships available, other work learning opportunities, past student successes or highlights, any program recognitions, and student career technical organizations or student professional organization affiliations. How do I request, confirm, and orient new members? A formal letter requesting membership should be sent only after an informal face-to-face meeting or phone conversation discussing the potential member’s contribution and role on the advisory committee. The committee’s success will depend to a large extent on how well members understand their roles at the first meeting they attend. New and continuing advisory committee members should be regularly provided with information relative to the committee’s purpose, function, structure, and goals as expressed in the committee’s work plan. What do new business members need to understand? What do I need to consider in the (final) selection of advisory committee members? Former students/alumni should only be on your advisory committee if they have several years of professional experience in the industry and are able to focus on the program’s future success, rather than past achievements. I live in a rural area, what advice can you give me? 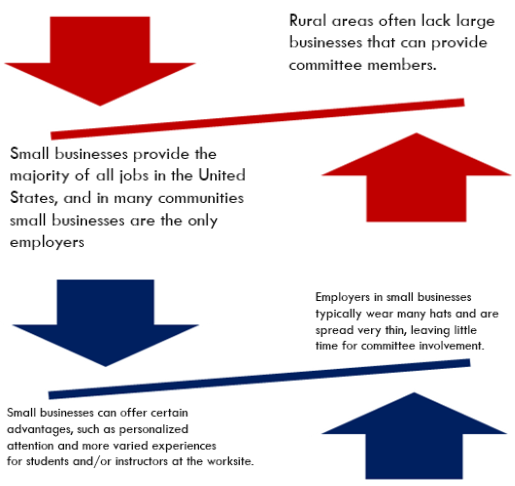 Committees may also want to work through the local chamber of commerce if they are members. How can our rural community utilize a Consortium to enhance our programs? As a rural school, you may be or want to consider being part of a consortium. Consortia exist when districts find it advantageous and cost-effective to cooperate with other districts in the management of their CTE programs. Individual districts may lack the personnel or the fiscal resources required to provide a broad range of administrative and student services. By pooling resources, districts reduce costs, avoid duplication, and provide for a more comprehensive range of services and programs. (In some instances, a BOCES or a community college may serve as the fiscal and administrative agent for the consortium’s Perkins funding. Refer to the CTE Administrators’ Handbook, Section V, Part C3 to learn more about the advantages of this arrangement. A program can also operate its advisory board as part of a consortium. In this case, each district would contribute to finding members but would not face the challenge of finding an entire advisory board. The shared advisory board would then contribute advice, resources, and expertise to all of the programs. A shared advisory board would work best between districts that have equitable programs as well as similar philosophies, policies, and procedures.